If you want to spark a long, convoluted conversation, ask a bunch of literary-theory nerds about authorial intent. That is, ask them whether what matters are the words on the page and the words on the page only, or if what th e author meant to say also needs to be taken into account. “Frail Shells” starts with text informing you that “Agent Mackenzie is stuck behind enemy lines” and that you have to engage in a search-and-rescue operation to save him. From there you are dropped into a war zone taking place on a Martian-red landscape with weird blue particles floating around. Everywhere you look soldiers are shooting at you, and when you shoot back and hit one of them, he flies away like a cardboard cutout caught in a gust. A simple, addictive loop of heroic martial music blares atop the constant staccato thump of gunfire. Once you reach Mackenzie, there’s an explosion, the screen goes black, and you wake up in your bedroom. When you pass through a door leading to a kitchen, Mackenzie is sitting there waiting for you, asking you how you’re doing (you and he appear to be in a relationship and living together). Now, instead of a click of your mouse firing your gun, it allows you to complete everyday actions: talk to Mackenzie, eat your eggs, and then, when you find yourself at work, interact with three computer monitors on your desk.
. . . except weird stuff starts to happen. Once in a while, the peaceful, barely-there piano music of your postwar life will be replaced for a few seconds by that martial theme from the war zone, and your gun will start to inch back into view, as though you’re raising it at Mackenzie, at your computer monitors at work. Soon, you find yourself able to again shoot, taking out objects in your environment (not to mention Mackenzie), and the effect is discomfiting. It only becomes more so when the furnishings at home and work start to disappear, suggesting a certain level of detachment from everyday reality. By the end of this short game, it’s pretty clear that “Frail Shells” is about PTSD and the return to civilian life after serving in a combat zone. How else to explain those feelings of heroism, and the attendant threat of violence, impinging on otherwise serene domestic and work life? How else to explain on-screen text — “Today felt really long” and “Why’s it so hard to fall asleep . . .?” — hinting that all is not right? The game isn’t subtle about its theme, but it delivers it very effectively. So how should a critic write about a game like this? 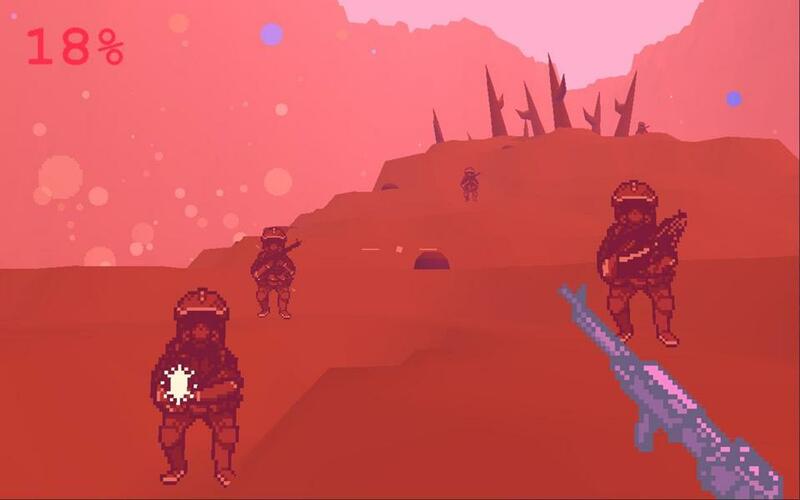 “Frail Shells” worked — or worked for me, at least — as a game about PTSD, regardless of the creator’s intent. But do I have an obligation to write about the game through Bai-Woo’s lens rather than my own? I’m tempted to say no. I think that by releasing the game, Bai-Woo is effectively saying, “Here, world: Make of this what you will.” This might sound silly or stubborn, but what I make of “Frail Shells” is that it is a very clever, moving game about PTSD. Bai-Woo — and anyone else — is free to differ.